Miller also does a lot of scoring for television and commercials, including spots for Honda, Pizza Hut, Kay Jewelers, and many more. With TV work, especially, the clock is ticking, and he needs to work fast. That's where his Mackie Big Knob Studio+ Monitor Controller/Interface comes to the rescue. "The Big Knob Studio+ is the cornerstone of my studio setup," reveals Miller. "When scoring for television, time crunch is usually an issue. You get an episode to mix, and you have to deliver in two days. You have a lot of people waiting for the finished product, and if you don't deliver, you're out of a job. It has got to be done right and quickly the first time." To achieve that rapid workflow requires a well organized and efficient studio, including fast, complete control of the monitoring system. "One of the biggest things when getting set up in this room was having everything available," details Miller. "When things aren't available or within your line of sight, you forget about them. No-one wants to sit around and wait for you to find the right sound or the right gear. It's got to be there for things to flow. So I'm constantly going to my Big Knob-it's become a staple of my workflow." The Mackie Big Knob Studio+ lets you switch between three audio sources and two pairs of monitor speakers, with independent trim on each source and monitor. You get mono, mute, and dim functions, and of course the eponymous Big Knob volume control. 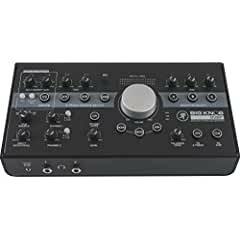 The Big Knob Studio+ also is a flexible 2x4, 192 kHz/24-bit USB recording interface, equipped with Mackie's Onyx preamps. Flexible source connections, dual headphone outputs, a built-in talkback mic, and 16-segment, high-resolution, input-source monitoring make this a powerful professional monitor control system. "I do most of my own mixing, and to feel confident that what I'm doing is going to translate to other people's systems and speakers, it's really helpful to go down to mono, to A/B speakers, and to monitor with and without the sub," explains Miller. "Without the Big Knob Studio+, that would be a challenge." Miller is amazed that every producer and engineer hasn't figured this out. "You've got to wonder how they get through a session without something like the Big Knob," he muses. "Mackie's Big Knob has been nothing but a workhorse in my studio. It has become a no brainer. This is my go-to."